Before the show starts, the audience watched a power point presentation of various wild and domestic animal attacks from the covers of 1940’s paperback books. On the night I saw the show, the talented and hilariously funny Keira MacDonald filled in for Kelleen and introduced the show, various “acts” followed as Keira, Scot and Jennifer read mostly macabre stories about animals. It is incredibly difficult to describe because their stories were a mixture of glee and triumph, but also untimely death, all at the same time, delivered in the most engaging manner. Sometimes the actors were even wearing cutesy animal masks! At the end there was a sing along to another power point presentation prepared by Shawnmarie Stanton. That is one of joys of 18th and Union shows, there is usually audience participation in the small intimate space, so one leaves with a feeling of having bonded with the rest of the audience. The highly sophisticated writing style was a mixture of Edgar Allen Poe suspense mixed in with Charles Addams imagery. 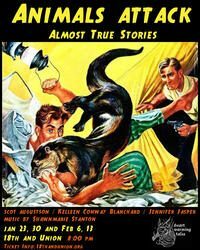 Particularly intriguing were all the sexual innuendos in the animal attacks which kept cropping up in all of the stories. With only one more performance to go, this show is a must see, I have never seen or heard anything else like it ever and the audience participation is worth it.